A vehicle drives on Main Street in downtown Wheeling. The Wheeling Metropolitan Statistical Area — which includes Ohio, Marshall and Belmont counties — had the nation’s eighth-highest rate of population decline since 2010, according to recent census data. 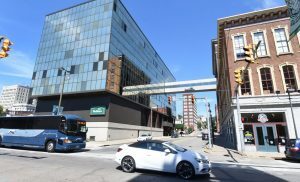 WHEELING, W.Va. — The metropolitan areas that contain much of the Northern Panhandle have two of the nation’s 10 worst rates of population decline, according to recent census data. The Wheeling Metropolitan Statistical Area — which contains Ohio and Marshall counties in West Virginia and Belmont County in Ohio — placed eighth on the list, according to a report published in USA Today. The Weirton-Steubenville MSA — comprised of Hancock and Brooke counties in West Virginia and Jefferson County in Ohio — was sixth. The Wheeling MSA’s population dropped 4.5 percent, from 147,901 people in 2010 to an estimated 141,254 in 2017. Of that loss, 3,761 was attributed to migration out of the area.